It’s a question we hear over and over; “What’s the ROI gonna be on my new brand identity?” For the branding industry, this question strikes to the heart of the challenges we face in building understanding of the business value in what we do. The reality is that often it’s all-but impossible to provide any insight into the return on investment spent on brand – the metrics are just too unreliable. Unlike advertising (online and above the line) and PR, there is rarely a clean view of the impact a new or refreshed brand identity has for a business. Too often a brand’s other activities and external factors such as ongoing advertising campaigns, new competition, new product development and consumer sentiment muddy the waters in terms of separating-out increased brand value. Online conversations post re-brand can provide anecdotal feedback, but it’s tough to put a dollar value on social sentiment. A few years back we re-branded TOM Organics. TOM was a rare case where the brand was spending virtually nothing on marketing and had failed to gain a foothold in any of Australia’s major retail/supermaket chains. Our repositioning, brand identity and packaging design was the only changes to TOM’s life, and they immediately were successful, seeing TOM product added to the two major supermarket chains nationally as well as the largest pharmacy chain in the country. Significantly increased sales followed. A great result for the brand, and although no more successful than much of our brand work – highly quantifiable for us. When a large, global brand updates its identity it is typically accompanied by a narrative on the cot of the design work and the value (or lack-of value) associated with that work. Those brands serious about their identity assets track their valuation annually in order to assess the impact of their branding activities. 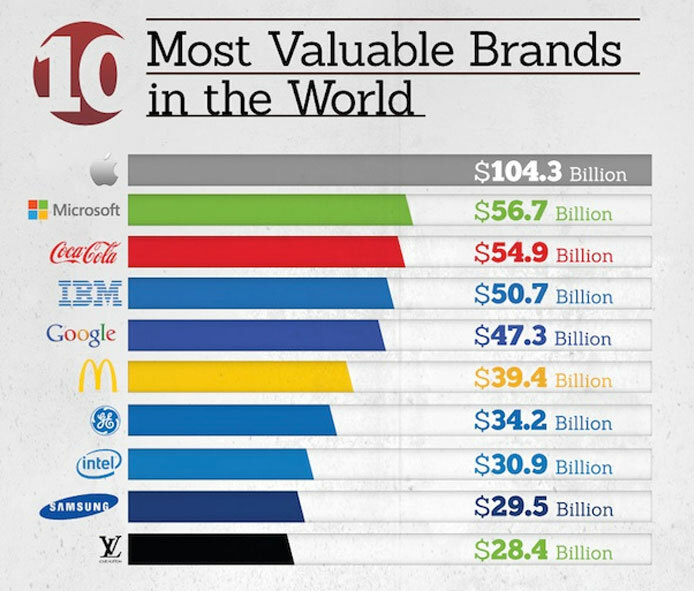 These brand valuations are expensive to carry-out, but when you’re talking about the worlds most valuable brands like Apple at US$104 billion, Microsoft at US$56 billion and Coke at around US$55 billion the stakes are high. 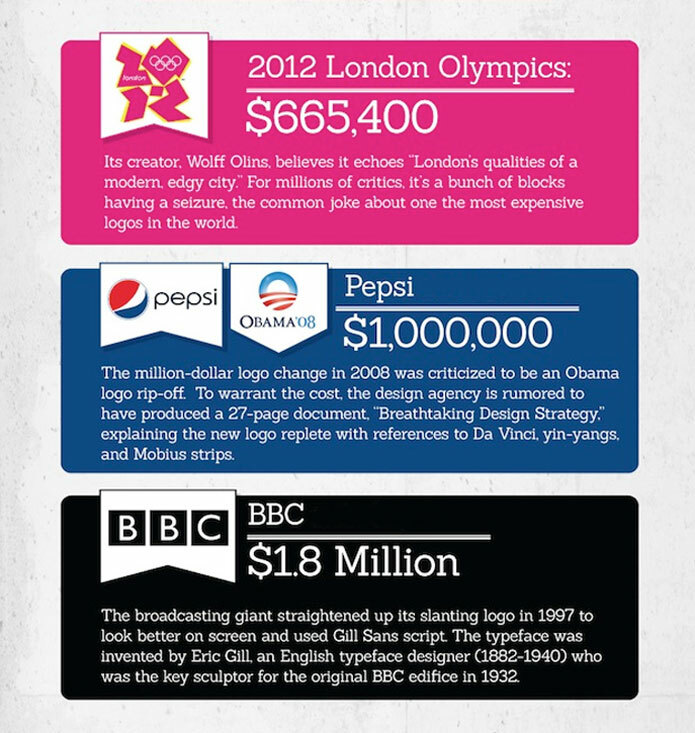 So what do these brands invest in creative the ‘logos’ which are the lightening rod of their value? 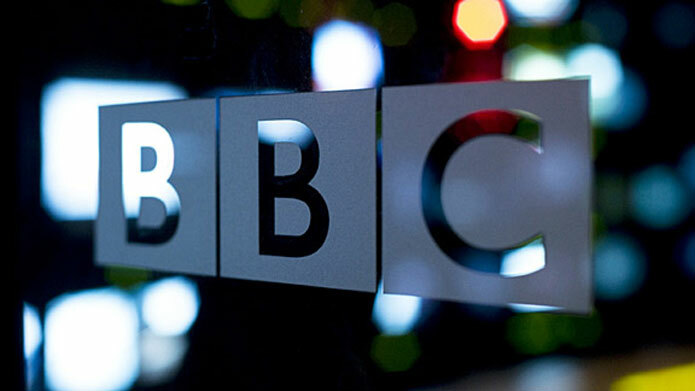 The costs of brand identity varies significantly from the $35 Nike purportedly paid for their brand mark back in 1971 through to the US$1.8 million paid in 1997 by BBC for a tweak to their brand mark. What we know for sure is that typically start-ups (such as Nike in 1971) are able to justify significantly less investment in branding than huge organizations such as Pepsi can. And what we have to remember is that for every $35 logo that over years is finessed into a multi-billion dollar brand, there around thousands if not millions of poorly designed examples that are consigned to the giant scrap heap of unprofessional design in the sky. Further the commentary around these high profile re-brands rarely takes into account the execution work required. Whilst $665,000 sounds like a ridiculous amount of money for the London Olympics ‘logo’, the full scope of works required would have been astronomical, and the bottom line profit margin threadbare when compared to many other consultants working on the Olympic games. Love it or hate it, the amount of publicity garnered by the controversial brand design for the London Games would have been worth its weight in gold. These hefty price tags do not only reflect the value of getting their new branding right, but also the costs of getting it wrong. Budgets are a relative expense. For a start-up, finding even $1,000 to invest on branding is hard to justify – where a tier one business wont look twice at a $1,000 bill for laserprints. The right way to view level of investment is relative to your competitive peers. Understanding the level of professionalism of your competition is a practical way of establishing where the bar stands. The challenge once you understand your level of spend is to find the most professional, experienced and creative brand designer possible within your price range, a designer who understands your business challenges, your market and has a track record of creating brand design that drives commercial outcomes.